Tapeworms are long, flat, intestinal worms found in humans and many other animals. Tapeworms, also called cestodes (SES-todes), infect humans worldwide, although they are rare in the United States. The most common species in humans are Taenia saginata, the beef tapeworm, and Taenia solium, the pork tapeworm. As adults, these worms stay in the intestines and usually do little harm. But if people become infected with the cysts (immature stage) of the pork tapeworm, they can develop a condition called cysticercosis (sis-ti-ser-KO-sis), which can damage the brain. This is a major health problem in many tropical countries. What Is the Life Cycle of the Beef Tapeworm? The eggs can survive for months or years in the environment. When cattle or other herbivores (plant-eaters) eat egg-contaminated vegetation, the eggs hatch and burrow through their intestinal wall. The larvae * burrow into muscles and form fluid-filled cysts, which are protective capsules. If humans eat raw or undercooked beef containing cysts, the cysts develop over a 2-month period into adult tapeworms. Adult beef tape-worms can live for more than 30 years. 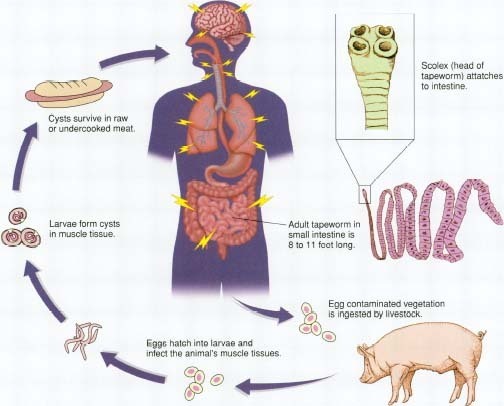 What Is the Life Cycle of the Pork Tapeworm? The adult pork tapeworm is about half as long as the beef tapeworm, usually 8 to 11 feet (2.5 to 3.5 meters) long. It also has a scolex for attaching to the intestinal wall and a body of about 1,000 proglottids. Each proglottid contains about 50,000 eggs. * larvae are worms at an intermediate stage of the life cycle between eggs and adulthood. The head of the beef tapeworm Taenia saginata, which is where the worm attaches to the intestine. © 1995 Science Photo Library/Custom Medical Stock Photo. Life cycle of the pork tapeworm. containing cysts, the cysts develop into adult tapeworms in humans. Adult pork tapeworms can live up to 25 years. Pork tapeworms also can cause a more serious infection, called cysticercosis. This happens if people eat or drink something contaminated with human waste containing pork tapeworm eggs. The eggs hatch into cysts in the intestines, and the cysts travel through the blood to the rest of the body, especially the muscles and brain. * epilepsy is a disorder in which a person repeatedly has seizures, sudden attacks in which the person may jerk, grow rigid, or lose consciousness briefly. What Are the Signs and Symptoms of Tapeworm Infection? Beef tapeworm infections produce only mild symptoms that may include diarrhea, abdominal pain, and weight loss. Pork tapeworm infections generally produce no symptoms. Cysticercosis, however, can cause muscle pain, weakness, and fever. If the central nervous system is involved, it can also cause epilepsy * or inflammation of the brain and the membranes around it (meningoencephalitis). How Do Doctors Diagnose and Treat Tapeworm Infection? Eggs and proglottids can be seen in stool samples by microscopic examination. But to tell which tapeworm—beef or pork—is involved, a scolex would have to be removed and examined. This is seldom done, as doctors usually can prescribe the same medication for both types of infection. Stools are checked at 3 and 6 months after treatment to ensure that the infection is gone. Cysticercosis is diagnosed by examining the muscles or brain with a CT scan * that can show the cysts. Blood tests for antibodies, which are substances the body makes to fight the infection, can confirm the diagnosis. Cysticercosis is also treated with medication but, in rare instances, cysts may be removed surgically. Tapeworm infection may be prevented by thoroughly cooking meat until juices run clear and the centers are no longer pink. This ensures that any tapeworm cysts in the meat are destroyed. * CT scans or CAT scans are the short form for computerized axial tomography, which uses x-rays and computers to view structures inside the body. The U.S. National Center for Infectious Diseases has a fact sheet about cysticercosis at its website.